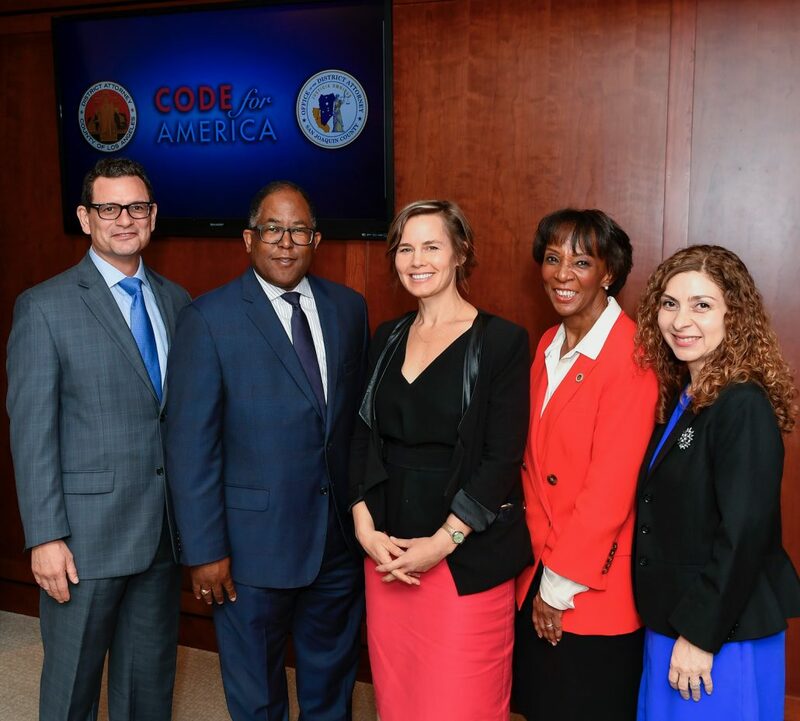 Public Defender Ricardo Garcia, Supervisor Mark Ridley-Thomas, Code for America founder and executive director Jennifer Pahlka, District Attorney Jackie Lacey,and Interim Alternate Public Defender Erika Anzoategui. Photo by Martin Zamora/Board of Supervisors. Los Angeles County announced a partnership with the nonprofit Code for America that would automatically clear more than 50,000 eligible cannabis convictions under Proposition 64. Code for America’s Clear My Record pilot program proactively identifies convictions that qualify for resentencing or dismissal under the ballot measure approved by voters in November 2016. Supervisor Mark Ridley-Thomas joined District Attorney Jackie Lacey at a Hall of Justice press conference announcing the partnership. 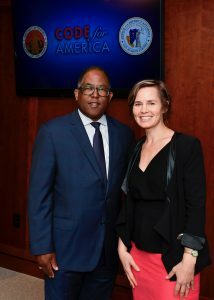 Supervisor Mark Ridley-Thomas with Code for America founder and executive director Jennifer Pahlka. Photo by Martin Zamora/Board of Supervisors. Last year, Supervisor Ridley-Thomas urged County leaders to develop a countywide plan to facilitate the resentencing of eligible cannabis convictions, and more recently called for utilizing innovative technology to accelerate such resentencing across Los Angeles County. Proposition 64 allowed certain cannabis convictions to be reclassified and resentenced. As of early 2018, however, fewer than 1,000 of those eligible for relief in Los Angeles County have filed a petition, partly because the process is cumbersome and time-consuming. With the aid of Code for America’s Clear My Record algorithm, the District Attorney’s office would be able to o automatically and securely evaluate an individual’s eligibility for record clearance by reading and interpreting conviction data in just a few minutes. This requires no action on the part of the individual.